This 21 November the world’s oil analysts are attempting to guess what OPEC will decide at its meeting in Vienna on 27 November. Before each OPEC meeting Bloomberg News asks a number of analysts their opinions on OPEC’s future oil production. Yesterday Bloomberg News published what 20 analysts think regarding the 27 November meeting. Half of them believe that OPEC will reduce its production while the other half believe it will not change. The possibility of impending reductions in oil production affected the oil price such that, in London, the price of Brent crude for delivery in January rose by 67 cents to $80 per barrel while in New York the equivalent price to the WTI rose by 95 cents to $76.80 per barrel. The fall in the price of oil by 30% since June has raised the issue of the profitability of oil production or what is called the “breakeven point”. This November, Chevron released its “Investor Presentation” and in it they discuss breakeven points for various forms of oil production and also the need for new oil production. In around 2008 the IEA and others began to discuss the decline in production from existing oilfields. By that time we at Global Energy Systems of Uppsala University had been researching in this area for some years and, in a scientific article, showed that the rate of decline in production from existing fields was 6% per year. Since then, this has become an accepted fact and even Chevron mentioned it in their recent presentation noting that production from existing fields will fall from 80 Mb/d to 30 Mb/d by 2030. Thus, new production equivalent to 50 Mb/d is needed by 2030 just to keep overall production constant. 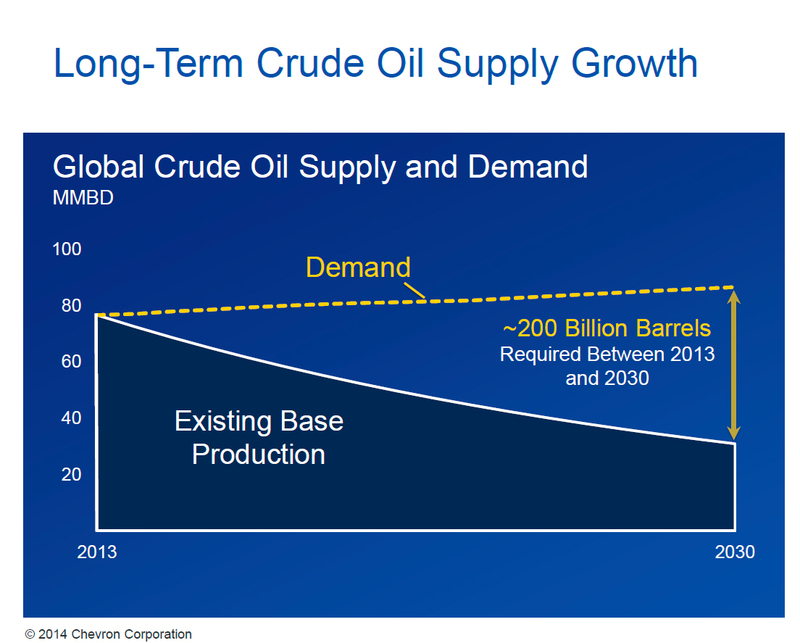 For the period 2013 to 2030 this is according to Chevron equivalent to approximately 200 billion barrels of oil. 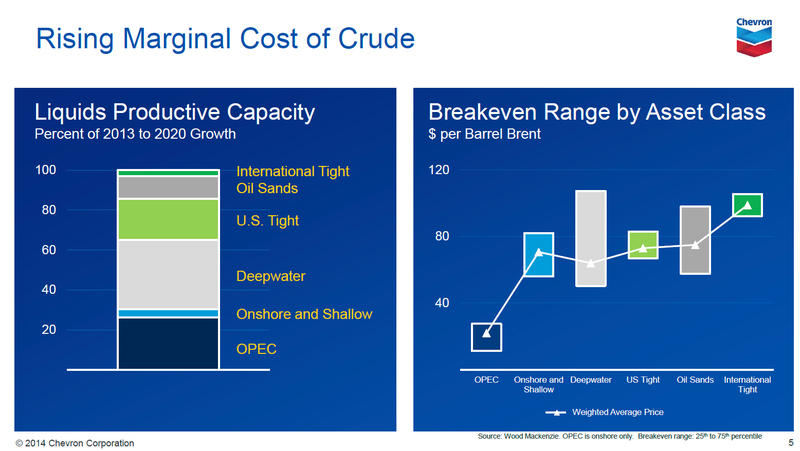 The Chevron presentation also discusses where this enormous volume of oil might come from and as you can see in the image the largest contribution comes from deepwater while 20% comes from US tight oil (shale oil) equivalent to 40 billion barrels. There are various estimates of how much shale oil exists in the USA but they discuss a volume of between 20 and 60 billion barrels. 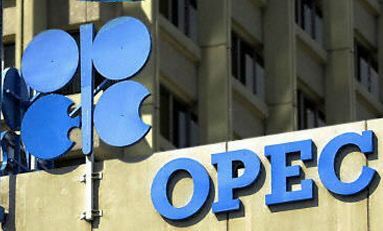 OPEC’s share comes mainly from upgrading of old oilfields and bringing on line some of the smaller fields that have so far been left unexploited. We should not expect large discoveries within OPEC. Once again I can mention that Norway’s new giant field will reach maximal production before 2030 and if that production reaches 300,000 barrels per day then, during 10 years this production will be approximately 1% of the total volume of new oil required. At today’s oil price of around $80 per barrel it is only OPEC’s production that is currently completely profitable and onshore and shallow offshore production are borderline in terms of profitability. Norway’s Jonas Sverdrup oilfield is expected to have a production cost of $40 per barrel and, compared with other oil production internationally, only OPEC’s is more profitable. Now we wait with excitement to hear what OPEC will say on 27 November. Regardless of whether they restrict production or not we are looking at a future of $100 per barrel or more.